SCRAPiVERSE: Friday Eve! Time to make a card! It's Thursday night- what a better night to sit down and make a card with your brand new Graphic 45 stamps? Even though it's only Friday Eve, I've already got a bad bad case of Friday Fever. I'm already having trouble sitting still and it's not even Friday and I'm not even at work. I had big dreams of doing a layout tonight. But like many big dreams, it died a horrible death. See? I used the letter stamps to turn it into a little liquor bottle! The set comes with various small stamps you can use to label the bottles, but none of them were as cool as the bottles! 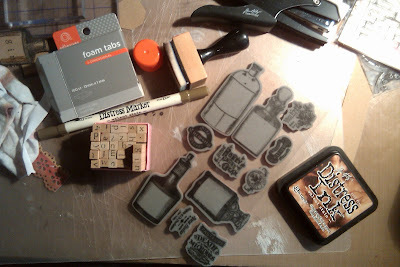 I was excited when I found my sets of letter stamps. I don't drink gin, I drink vodka. But 'gin' is a shorter word and I'm lazy. I kept it very monochrome. I embossed the piece on the back with a folder from the Sizzix 'Figgy Pudding' set, and very lightly edged it with some Walnut Stain Distress Ink. The card under the bottle, I edged using the Walnut Stain Distress Marker- these work GREAT to quickly put a faint line on the edge of a piece of card! Just drag it across and BANG- classy card. I also used foam dots under the bottle for some dimension amongst all the kraft, but it didn't translate well in the photo. I thought this would make a nice invitation for a night of drinks. Because I'm sure all of you are like me, and when you want to invite someone out to drinks, you send them a nice card with a bottle on the front. I hope you aren't getting bored of kraft, cuz I'm not- I just might start a new blog called "Kory's Kraft-y Kingdom." No, maybe it should be a video blog, and I narrate the entire thing in monotone Rick Steves PBS travel show style. Have you ever watched this guy? I seem to catch his show often, while waiting for Lawrence Welk to come on- oh, you didn't know that I like Lawrence Welk? I don't really- only when they do production numbers. I appreciate the insanity of it. Well, as Holly's Mom says, "I'm gonna make like a baby and head out." See ya, people. Cool card! Hmm, now I must look for those stamps and embossing folder. Huzzah for Friday Eve! Pass the vodka. LoL, no, I think you copied the kraft based card I made last week! That card is amazing!!! The pattern and texture, so awesome, love the stamp and how you used the alphabet stamps, simply awesome! Love the idea of the distress marker on the edge, smart! Thanks! I am still laughing at myself...my bifocals may need adjusting. I thought the card said "sin" not "gin". Love the card and love your enthusiasm for life, Kory! I really really like this card. Love the lettering. It all goes so well on the brown. I read it a Gin but I really think Sin would have been better. Love the card, especially the inking on the stamped image! And the embossed base. Kraft is always good in my book. P/s: Love those bottle images...hope my LSS stocks up on that soon. I love those stamps! Cool card!